Here’s the thing about Twisted Metal. It’s the best car combat game out there. The controls are a little squirrelly, but David Jaffe and Eat Sleep Play manage to mostly hit the mark as the series makes it first appearance in the current generation of gaming. The unfortunate problem with that is, no one’s around to see it right now! 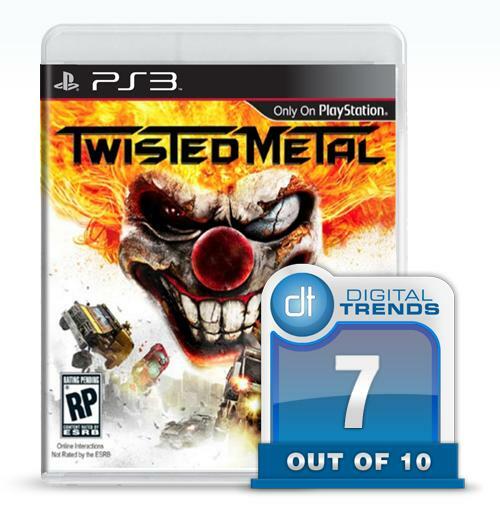 Like it’s predecessors, Twisted Metal is at its best as a multiplayer game. There’s always been some level of single-player story, and that’s certainly in evidence here — for better and for worse, as you’ll soon learn — but the real fun begins once you add other human players to the mix. In the case of the PlayStation 3’s Twisted Metal, finding other players at the moment is a bit of a tall order. It should be mentioned here that TM stumbled right out of the gate when it arrived last week with the official servers seemingly offline. Firing up the game, you’d immediately be greeted with a message to that effect as it tried to sign on. That issue was worked out at the end of last week, but it made for some very light traffic over the weekend. While I’m not going to hold a rocky launch against the game for the purposes of a review (see Battlefield 3, Call of Duty Elite, and about a thousand other games, programs, etc., etc. ), it’s fair to say that the experience will definitely suffer if more fans don’t start taking the action online. With that said, let’s talk about the game. On the solo play side you’ve got three separate stories for three of the game’s main characters. Each one leads into the next, starting with Sweet Tooth, followed by Mr. Grimm, and ending with Dollface. Each story follows the same basic framework: intro live-action cutscene, a few events in the Twisted Metal competition, another cutscene, some more events, a boss fight, then a final cutscene. The story-connected events are perhaps the weakest component of the game overall. Each one is a slightly tweaked version of one of the standard online modes, so you might have to kill everyone while staying inside a constantly changing protective field or take out a competitor-spawning Juggernaut vehicle before you can finish the event. The gravest misstep is a racing event type; that sort of play just doesn’t fit within the Twisted Metal framework and it quickly becomes an exercise in frustration. The great shame of that is the story elements are actually the tightest that they’ve been in the life of the series. 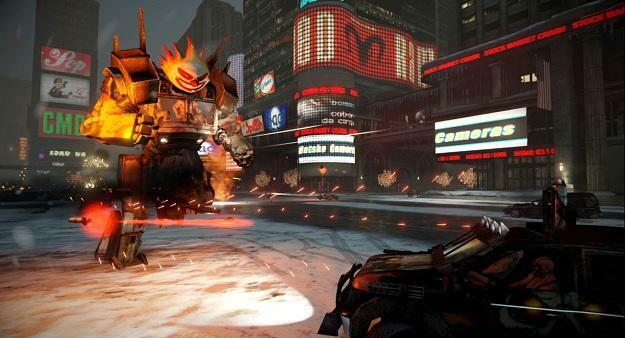 Twisted Metal games have always had a fondness for incorporating live-action elements, but they really work here. The cutscenes are very well put together, striking a perfect balance between camp and creepiness. For anything you want to say about the game, there’s also some great short-form fiction here. Separate from all of this on the single player side is a Training mode, which isn’t nearly as front-and-center as it should be. Twisted Metal‘s default control scheme is not the most intuitive, and it’s easy to fly past the tutorials if you’re diving straight through the menus in search of the game. There’s also a Challenge mode, which allows you to set up a bot-populated game using one of the multiplayer match types. Moving over to the online portion of the game, all of the familiar vehicles are back along with a few new ones. The big cosmetic change is that you’ve no longer got any character-specific rides. Instead you’ve got four gangs, run by Sweet Tooth, Mr. Grimm, Dollface, and Preacher, respectively. 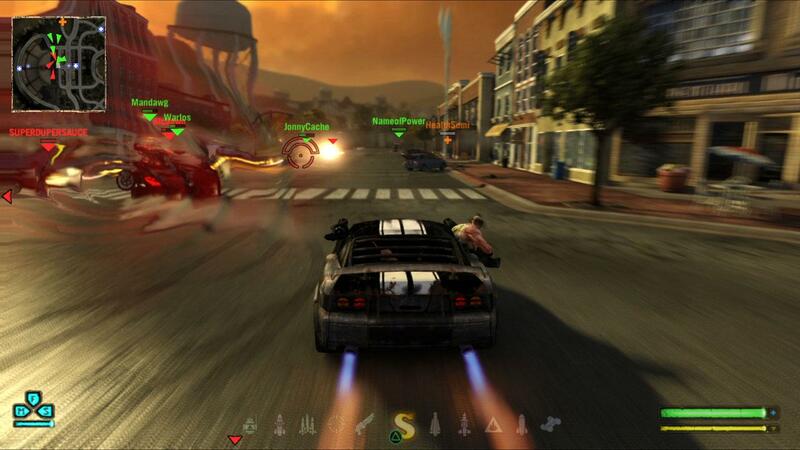 Team-based match types split the action along these lines, with themed gang members visible as the drivers and passengers in each vehicle. In terms of actual gameplay, you’ve still got some vehicles that are better-suited to certain things than others. Overall, however, the vehicle roster feels surprisingly balanced. I was worried going in that the helicopter, Talon, would throw things off too much, but its ability to skirt around the map is more than offset by its light armor and its ineffectiveness at avoiding lock-on attacks. It’s a powerful weapon in the right hands, but it’s in no way a clear “best of the best” on the vehicle roster. You’ll find new gameplay modes and familiar ones once you hop online. Free-for-all and team deathmatch are present, of course; the demolition derby-style Last Man Standing; Hunted, which plays like a team-based VIP mode; and the all-new Nuke, a capture the flag variant in which each team must capture the opponent’s leader, bring him/her back to home base and shoot the captive out of an oversized cannon at the opposing team’s giant statue. Yes, it’s bizarre. It’s also fun times. This is a game that doesn’t take too many chances, preferring instead to embrace what’s kept fans coming back for so long. It’s hard to fault that approach with a franchise that is only now putting in its first current-gen appearance. Twisted Metal isn’t perfect, but Eat Sleep Play did a solid job of bringing back the series’ unique blend of car combat chaos with its Valentine’s Day release.